Disgo 7000 price and review. 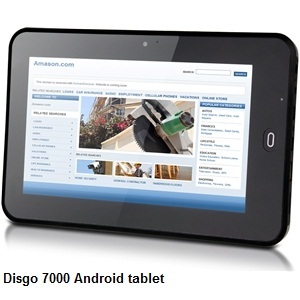 Disgo 7000 Android tablet specifications and review. The Disgo 7000 is a multi function touch screen tablet that offers all the features and functionality you could want at an affordable price. Highlights include the impressive new Android 2.3.x Gingerbread Operating System, an ulta thin body of 10.5mm, Full HTMLS support for the next web generation and it comes pre-loaded with easy to use applications. Watch, listen and browse for longer with twice the battery life of 1st generation models. Easy to use with preinstalled apps, this little device will have you browsing and socially aware in seconds. This slim and portable Tablet PC will be boasting Android 2.3, the latest Wi-Fi connectivity and extra-long battery life. Disgo 7000 price - Disgo 7000 costs around £70 in the UK. What we think of it? Disgo 7000 is an interesting gadget for the money, just don't expect miracles from it. It might work as a nice present for youngsters as well.